The role of narratives in our everyday lives is profound. They encourage us to engage with our pasts. They situate us within our societies. They craft the stories that shape our moral universes. They allow us to imagine different futures. They help bring us together as communities. Narrative is a powerful device for helping us engage with the Anthropocene in reflective and critical ways. When we narrate experiences within, through, and about the Anthropocene, we are in fact conceptualizing the Anthropocene through our own lived experiences and cultural frames of reference. At times, these narratives are congruent with those of others. At other times, they are at odds. No matter what, they become sites of dialogue and exchange. We have coined the term “Anthropocenoscapes” as one way to encourage these dialogues–to inspire playful, reflexive, and generative narratives about the Anthropocene. Simply defined, an Anthropocenoscape is a set of narratives about an Anthropocene landscape that are meant to spur active dialogue between their creators. The forms these narratives take might range from memoir to autobiography, from epic to fable, from historical fiction to legend, from news to parable. They might be nonlinear, quest narratives, poetry, or prose. They might be told through illustrations, songs, storytelling, or photo essays. The key is that an Anthropocenoscape is not simply a story about a landscape. It is a set of stories, told together about place, time, and memory. They are meant to open up new understandings about place, time, values, and connectivity in the Anthropocene. They allow us share our own experiences while learning from those of others. Anthropocenoscapes are a way to speak with and across divided perspectives, to share knowledge with others—students, colleagues, friends, or family. And they work by telling the story of a place. Making an Anthropocenoscape can be a useful tactic when trying to learn from each other’s perspectives, perhaps with new colleagues, collaborators, students, funders, or communities. 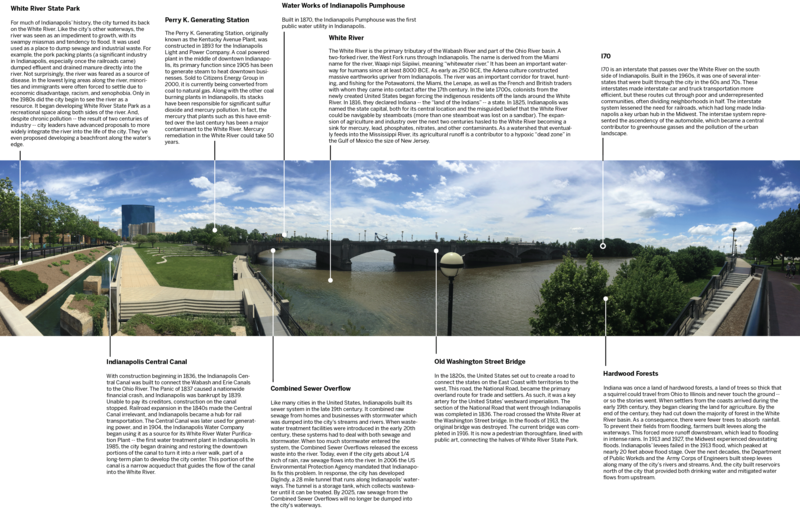 We created our first Anthropocenoscape in Indianapolis where the authors of this primer gathered in May 2017. On a warm (in fact quite a muggy day), we made our way to the bank of the White River—a large unnavigable river that runs through the city of Indianapolis. Jason M. Kelly started the exercise by positioning the group at a vantage point that offered a broad view of the river. He began by pointing out human changes to the land–visual components such as the bridge, the combined sewage overflow, the embankments. Next came the invisible histories, the erasure of Indigenous presence, the toxicity of the water, and the role of waste water. His contribution to the Anthropocenoscape was a visual history of human engagement with the White River in the age of the Anthropocene. Afterwards, the group returned indoors. We separated to reflect on our experience with the White River landscape. Participants created narratives that told stories of places near and far – of landscapes reshaped by human action. The forms ranged from poetry to visualizations to recordings of conversations with other people. And, they helped us better understand the many ways that we conceptualize our experience of the Anthropocene. Below are a few examples. Returns to old haunts are often tinged with sadness. My return to Niger after a hiatus of 18 years was no exception. I returned to West Africa with several Nigerien friends from New York City’s Malcolm Shabazz Harlem market, a sensuous slice of West African social life in one of the Big Apple’s most fabled neighborhoods. As soon as we landed Niamey, Niger’s capital city, the oven-hot air of the Sahel grabbed us like an angry wrestler. The airport hadn’t changed that much, but I immediately notice something I had never witnessed in Niger—a serious traffic jam. The smell of car exhaust permeated the stale air and the blaring car horns disturbed what used to be the quiet of a late Sahelian afternoon. Our taxi deposited me at the research center of the University of Niamey where I had reserved a room. Once settled I walked up a dusty dirt road to the Le Petit Marche, a place where I spent many wonderful hours sitting in the shade on straw mats, where I talked to herbalists as they prescribed medicine for skin ulcers, lung congestion, malaria, and dysentery. To my dismay, I found only one of my many friends, most of whom had left the market and relocated in the countryside. From Le Petit Marché, I walked to the main market, Le Grand Marché. The city seemed dirtier, more congested. Skeletal beggars asked me for a few coins so they might get something to eat. Toward dusk, I heard the call to prayer and saw hundreds of the faithful block Niamey’s main street as they pledged their fidelity to Allah. In the market, I asked my New York friend, El Hajj Angu, about all the changes I had witnessed. “That’s why I went to America. There was no food here, and commerce was bad, so I went to America. That’s why so many people have come to Niamey. It’s too crowded. If there isn’t enough rain, young people don’t want to farm. There’s not enough water. There’s filth and garbage everywhere. More old people are hungry. More children die of simple infections. People have always been poor here, but now it’s worse. The rainy season is different now. Look at how it has changed everything. “What can be done?” I asked him. A heavy sadness slipped into my being as I realized, perhaps for the first time, how much climate change—the result of human behavior in the world—has shaped the quality of our social lives. In 2009, I returned to America determined to do public anthropology—an attempt convey to a general audience anthropologically contoured insights about climate change, politics, higher education, media, and well-being in the world. Such is our challenge and our scholarly obligation.